Vinotemp specializes in a wide assortment of wine racks and rooms, as well as Wine-Mate cooling units. They work together with your contractor or designer as well to provide components you need to construct an awesome wine room! Vinotemp is a family owned business that is located in Southern California. They go the extra mile to fine tune the details before releasing products to the public. Make your wine storage dreams a reality with Vinotemp! Vinotemp has over 30 years experience and a talented team of designers ready to make your wine cooler dreams come true. Whether you know exactly what you want in a wine cooler or room, or you are just starting out, you can trust the knowledgeable and experienced design and sales team to guide you along the way. 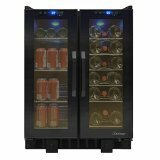 Featured here is an excellent selection of wine coolers available for sale. Simply click on the pics or tags for more information and pricing. The VT-36TS is perfect for those who love to entertain. 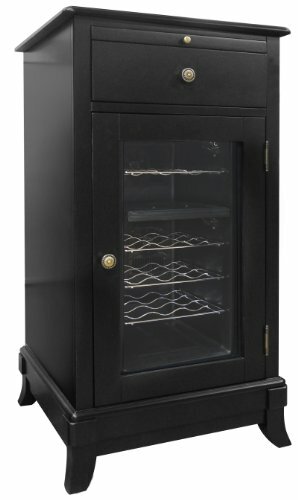 This sleek all-black cooler can house up to 19 standard wine bottles on the right side and 58 12 oz. cans on the left side. Front exhaust allows this cooler to fit seamlessly into existing cabinetry, lending a modern touch to any room. Touch screen control panels located at the top of each door allow you to monitor the temperature as well as adjust the temperature as needed. Front exhaust for under counter or free-standing installation. Push button temperature control panel with LED display. Compressor technology creates the perfect environment for wine. Soft blue interior light. Black cabinet with insulated glass door. Sturdy stationary metal wire racking. Temperature range: 45-65F. Approx. bottle count: 58. Made from glass. Silver color. Assembly required. Depth with handle: 25 in.. Overall: 24 in. L x 23.38 in. W x 34.38 in. H (113 lbs.). Organize and store your collection in style with wine cooler with interior display. 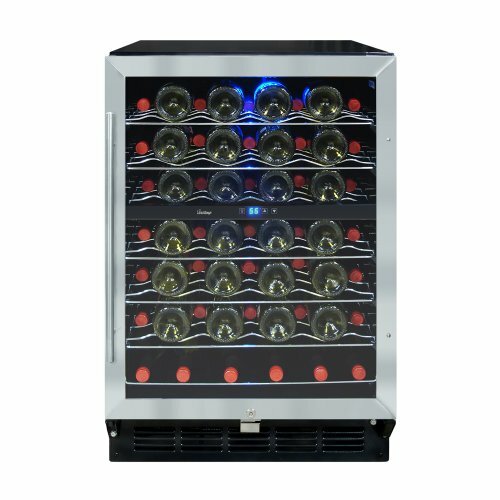 This cooler is ideal for the wine lover who is looking for a space saving wine storage solution. The fact that they can accommodate any size space, makes them the "go-to" place for wine cooler and rooms! ​Choose from a wide array of products below, or use the search bar to search for more. Houzz is a website and online community about architecture, interior design and decorating, landscape design and home improvement. The Houzz platform and mobile apps feature photos, articles, product recommendations, and a user forum. The wine coolers featured below work in a variety of spaces for all your beverage cooling needs. Click on any product to learn more. Whether you need an ice bucket, wine rack, or other wine accessories, you can find them on Houzz! ​ Click on any photo to learn more about the featured products below. You'll love the quality and design of these products!